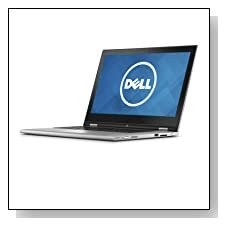 Dell i7347-10051sLV is the new 13.3 inch convertible / hybrid notebook as part of the Inspiron 13 7000 Series, with a Full HD IPS touch display, Haswell Intel i5 processor, large amount of memory for multitasking and connectivity options. 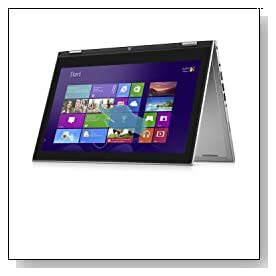 It is a modern machine that gives you the flexibility of moving between a powerful laptop, tablet with integrated Stylus, stand or tent modes conveniently for watching videos, working on Word or Excel, playing light games and perform other daily tasks in the mode that suits the purpose best. It is good for internet, entertainment, multimedia, school and work- moderately demanding applications. Dell Inspiron i7347-10051sLV has the high end 4th generation dual core ultra low voltage Intel i5-4210U processor (3MB cache) between 1.7 to 2.7GHz speed with turbo boost (increasing speed automatically when tasks require it) and hyper threading (2 cores handling 4 threads in parallel), 8GB DDR3L SDRAM at 1600MHz (8GBx1), 500 GB 5400 rpm SATA hybrid hard drive with a few gigabytes of Flash drive added for fast boot-ups and waking up from hibernation and 64-bit English Windows 8.1 operating system. 8GB RAM is good for multitasking of several apps and browsers and 500GB should be enough for most computer users to save their songs, videos or common files. Vibrant 13.3 inch FHD (1920 x 1080 pixel max screen resolution) widescreen (16:9 aspect ratio) Truelife LED-Backlit IPS ( large viewing angles) capacitive 10-finger multi-touch display with gesture recognition and precise pointing for navigating Windows 8 functions smoothly, offering sharp crystal clear images with fine details and Intel HD 4400 graphics that is OK for general multimedia tasks but not heavy gaming- this is not a gaming laptop but you can play older titles at higher settings. Sound is quite good with the HD Audio with Waves MaxxAudio and stereo speakers. It has an integrated HD webcam with built-in microphone for video-conferencing or chatting live on Skype. System is fast and powerful enough for medium level gaming- not the latest games at high settings or complex media editing but fine for pretty much everything else- lighter gaming and daily tasks. Silver Dell Inspiron weighs 3.7 pounds with measurements of 12.99 x 8.74 x 0.75 inches- slim, lightweight, compact and portable- easy to travel with with long battery life of up to 8 hours from its 43 WHr 3-Cell battery with its ultra low voltage processor and power efficient graphics so you don’t have to recharge for quite a while. Keyboard is both backlit for working comfortably in the dark or dim light and spill-resistant for when the spillage accidents happen, is comfortable and ergonomic with touchpad also optimised for Windows 8 but without the 10-key numpad. It has no optical drive (you can purchase an external one and connect through one of the USB ports) but the fastest Dell Wireless-N 1708 802.11ac wireless with larger coverage, Bluetooth 4.0 tied to wireless card, 1 x Microphone/Headphone combo jack, 1 x micro HDMI Out port, 2 x USB 3.0 ports, an 2-in-1 Media Card Reader, FastAccess Facial Recognition and wired LAN- Ethernet connection is not mentioned in specs. Conclusion: Dell Inspiron i7347-10051sLV has an elegant design, a powerful Haswell i5 processor, generous amount of RAM and adequate storage as well as a Full HD IPS display for clear realistic image and vibrant colours. It is built to be durable- last a long time with solid hinges so you can experience the power of laptop and versatile tablet. It is offered with a 12 month Mail-In warranty, comes with the 30 day trial version of McAfee which you may want to replace with free AVG and trial Microsoft Office. Like many other modern compact laptops, it has no DVD drive (to help with slim and lightweight compact factor and when was the last time you used DVD Drive on your computer? ), no 10-key numpad (again due to size but the keyboard is both backlit and spill-resistant), has only 2 USB ports (but they are both the fast USB 3.0 variety), battery life is great at up to 8 hours, weighs just 3.7 pounds and is 0.75 inch thick, touch display for smooth navigation on Windows 8. Dell makes great reliable laptops and this versatile hybrid is a nice one at an affordable price- considering you don’t have to own a laptop and tablet separately, without sacrificing power and speed like on some other machines.